ShellShadow is a tool to allow server admins to get help from other server admins. Think of it like a desktop screen sharing tool but for your server's command line interface. Watch a Flash demo here. ShellShadow is a "collaborative" SSH client available free here. We have clients for Windows and Linux users. In addition to being a rock solid SSH terminal client, ShellShadow enables two users to safely access the same terminal session. Read our how to guide or read the FAQ. 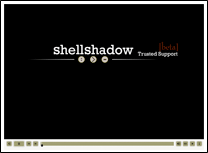 The ShellShadow collaborative shell is the safest and easiest method to engage in server support. For now, you can try out this experience for free. Create an account now and give it a try. You can test the collaborative client by creating a relay session between you and yourself! Supervise your support session by setting access levels and observing the fixes as they are implemented. Control the entire process from start to finish, never giving out critical information for your server. Still confused? Our Flash demo provides a great overview of a server support session. Need support? Create support requests through the ShellShadow web site. You may also directly find a support pro. The ShellShadow marketplace is simple and open. There are no fees to list support requests and no obligation to use the ShellShadow tools for support. For a support pro, you have no commitment to continue to use ShellShadow for customers you find through our marketplace. Free and Open. We are in process of seeding our marketplace with support pros. Invites are going out soon to create support profiles. If you are a server expert, contact us us and request an invitation. Once we have a solid amount of support profiles, we will open the marketplace for support requests.